I can’t pretend that this has not been a challenging 6 months. I have learned a lot about myself, about cancer and about the world around me. I have laughed hard, cried a lot and loved like crazy over these months. When this journey first began, the end of 2015 felt so far away. I wondered how the time would pass and how quickly. I wondered if I was strong enough to see the end of the treatments. I questioned my own abilities. Now that the end of the year has arrived, I have a new sense of peace. I know that there is still a long road ahead of me but this phase of the journey has come to an end. I will start 2016 with the chemo treatments behind me and that, my friends, is priceless. When I graduated with my Bachelor’s Degree, I had no intention of walking across the stage. I had already walked when I received my Associate’s Degree and didn’t feel the need to do it again. Working towards my Bachelor’s Degree took longer than I anticipated and I was relieved to be at the end of my college journey. I was glad to be done and I was ready to move on and that was that. Or so I thought. After further conversations with my family, I decided to walk and end my long years of schooling at the stage. I went to the graduation ceremony and while sitting and listening to the opening speech, I looked back and saw the smile on the face of my family member’s – my husband, his parents, my mom and my baby sister. They each sat there with wide smiles, cheering me on and supporting me. I walked across the stage with a huge smile and a sense of pride. I didn’t understand the importance until I walked across the stage that day. I hadn’t realized that I needed to mark the end of this portion of life and for my family, who supported me throughout my many, many years at college, to witness me receive that degree. I experienced something similar today. I remember walking past the bell in the infusion center when I went for my first treatment. I saw it hanging on the wall, read the sign and thought it was neat. I thought it was a nice way to signify the end of chemotherapy treatments. When I first saw it, I didn’t think I would ring it. I’m not sure why but I felt like it wasn’t something that I needed to do. I didn’t think much of it. Until recently. At my last treatment, I asked the nurse her thoughts on ringing the bell after my first 6 rounds or after I finish my year of Herceptin. Her reply? After BOTH! As the weeks went on, I started thinking more and more about that bell. I thought about how I felt initially, about it being unnecessary, and I thought about watching a sweet woman cry when she rang it while I watched after my last treatment. I thought about how I cried, seeing her ring that bell and hug her family. And I realized, I misunderstood. I misunderstood the bell in the beginning. I didn’t get it because it was my first treatment. I was naïve to what the next few months would be like going through these treatments. I misunderstood what the bell meant; what the bell represents. This bell symbolizes every step of this journey over the last 5 months. It represents every treatment, every doctor visit, every tear, every pain point, every missed moment, every frustration, every moment of fatigue. But it also represents all of the moments in between those treatments – the kind words, the prayers, the cards, the happy tears, the laughter, the family time, the sister snuggles, the dance parties, the new friends and so, so much more. It represents ending this portion of my journey and moving on to the next. This bell represents strength that I never knew I had in me. I didn’t understand how important it was to ring this bell, until it was time for me to ring it. And today, I did just that. After a long, 8 hour day, I stood in front of my wonderful husband, my sweet sister, my kind friend and all of the incredible nurses and I rang the bell. And now we move on! After moving to Florida, Christmas was always an odd time of year for me. I was used to the cold weather and my own family traditions from upstate New York, so the first few years were tough. I missed my sister snuggles and the yearly attempt my parents made at pop over perfection (the struggle was real!). One year, Joe & I were talking about what to do Christmas Day. We had tried spending Christmas Day at home but it felt a little off because it was just the two of us and the weather was warm. That’s when it hit me. We need to embrace Christmas in Florida. Instead of trying to make it feel like the Christmas I had in New York, we needed to create the Christmas we want here in Florida. Seems simple, right? That year, we headed towards our favorite restaurant near the beach, only to find out it was closed Christmas Day (oops). Hungry and disappointed, we started driving again and passed a restaurant that we had talked about trying before. We pulled in and grabbed a table. We enjoyed a really nice meal with a wonderful waitress but it just didn’t feel right. It wasn’t quite the Christmas that I was looking for and I felt bad eating out on a day that everyone should be with their families. After our meal, we headed towards the beach to spend the afternoon. As we sat staring at the ocean, I realized that this was exactly what I was looking for in my search. What’s more Florida than Christmas at the beach?! And our tradition was born. For the last five years, we have headed to the beach on Christmas Day. We grab a picnic table or two, Joe heats up the grill and we sit enjoying the ocean air while cooking chicken wings, potatoes and a yummy veggie. Some years we spot Santa handing out candy canes while walking in the sand, while other years there are barely any people around the beach at all. It’s become our “thing” and I love it more and more every year. 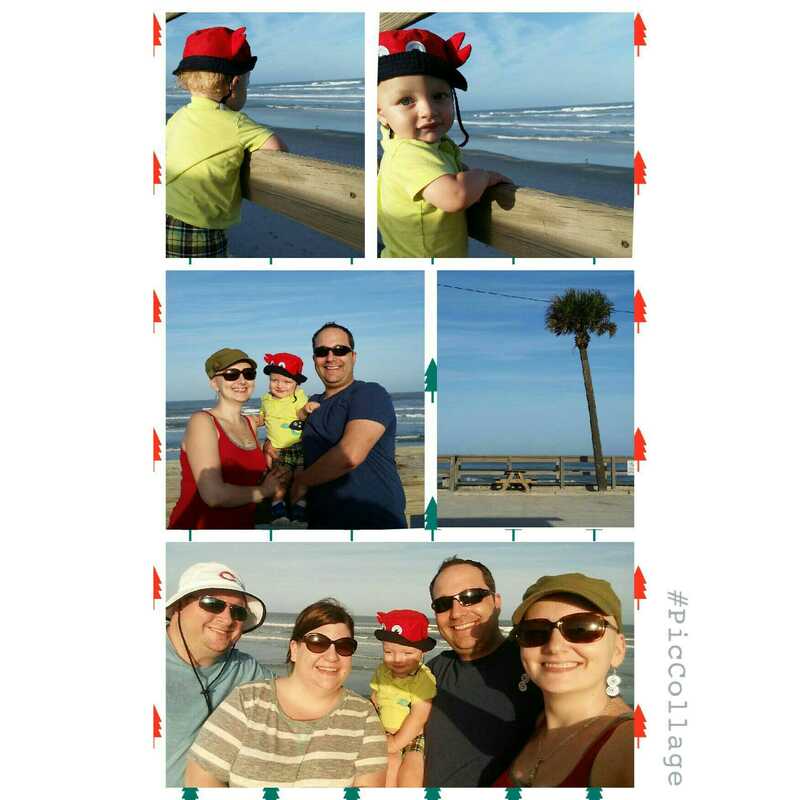 Last year, Jacob joined us for his first Christmas Day beach trip and this year our friends joined us as well. Though this was the warmest year yet, it was still filled with fun and laughter. Though Christmas in Florida is not filled with snowmen or hot cocoa, it is filled with a sandman or two and love. And that, my friends, is what makes this holiday so wonderful. I hope your holiday was magical, no matter what traditions you have. I love the Men in Black movie trilogy. I have many memories of staying up way past bedtime and watching the first movie while forcing my eyes to stay open, despite knowing exactly what was going to happen next. I also remember how excited I was when the second and third movies came out. It’s been a while since I have watched any of the movies but they will always bring fond memories for me. There is a scene in Men in Black 3 that I have been thinking about a lot since starting this journey. During my first treatment, I sat down and watched the entire Men in Black 2 movie because I thought the scene that I was looking for was in there. About halfway through, I realized it wasn’t – oops! I didn’t own MIB3 at the time but couldn’t shake this scene from my mind. I eventually ordered the DVD for super cheap. While recovering from my last treatment, I watched the movie – and fell in love with it all over again. One of the characters in the movie can predict the future but that prediction is based on what happens immediately before that particular future. There is a scene in the movie where we meet this character, Griffin, and learn about his abilities. We also learn the downstream impacts of something as “simple” as a fight between two people. The scene is used to demonstrate Griffin’s abilities and set the scene for the rest of the movie. I love Griffin’s character, not only because of his quirkiness but because of what he represents – the impact that our actions have on the future. We are blessed with free will and therefore have the ability to choose what we want in life. Every decision that we make on a daily basis is setting the foundation – and the tone – for our future selves. Each decision also has the potential to impact others, positively or negatively. We may or may not ever see the impacts that our actions have, but that doesn’t mean that they aren’t there or that they don’t happen. Sometimes I wonder what actions I took or decisions that I made that brought me to the life that I have today, including my diagnosis. I let my mind wander, ever so slightly, to my past and what may have led me here. I don’t let myself get far though. Despite my diagnosis and the fight that I am in currently, I wouldn’t change a thing. I have made my fair share of mistakes in life but all of those decisions, all of those actions, all of those mistakes, brought me to where I am today. And that today is filled with more love than I ever could have dreamed of in my earlier years. The today that I live in has moments of sadness, frustration and tears – but it also has an overwhelming amount of love, laughter and happiness. You see, my friends, the future that we create for ourselves is based on the life that we decide to live today. I feel that the more happiness and love that we fill this world with, the more we will be blessed with in our futures. Merry Christmas Eve, everyone. Hug your families and smile brightly today and always. Sorry to disappear for a bit, friends. It was a rough week. I was sick with bronchitis and an upper respiratory infection and then poor little man came down with bronchitis and pneumonia. Talk about scary! I’ve never seen his fever so high and it took days to go away, even with antibiotics. We canceled all our plans while we recovered and thankfully we are both feeling more like ourselves now. This week, we are taking time to focus on our family by enjoying much needed time together. We are excited for Santa to visit little man and to spend time with family and friends, enjoying the moments together that make this life so wonderful. I hope you all have lots of family time planned for this week. It’s easy to get caught up in the hussle and bustle of the holiday season but I am learning throughout this experience that the chores and the to-do list will still be there tomorrow. It’s the time together, spent with loved ones, that truly matters. I’ve been fighting off a cold for almost a week now and I finally caved and visited a doctor. It makes me nervous to get sick with everything going on in my body and I want to be healthy for the holiday so I figured it was best to get checked out. It’s basically a cold gone bad, so slight upper respiratory infection / bronchitis. I started a round of antibiotics tonight so I’m hoping they kick in quickly. Sleep isn’t coming easily due to the nasal congestion and throat pain. This is my third sickness after treatment – I am seriously over being sick! Little man also visited the doctor today, though this was a scheduled visit to the ear, nose and throat doctor to chat about whether or not to put tubes in his ears. He has had 6 ear infections since late March, with two of them being doubles. Today is ears were clear with no signs of fluid or infection so that’s great news. The doctor said that he is prone to ear infections and that it is only a matter of time before another one hits, especially this time of year. So now we have a decision to make. I’ve heard a lot of great things about tubes and a few not-so-great things. The regular use of antibiotics at such a young age scares me, plus I hate how badly ear infections make little man feel. But surgery also scares me, despite how short the procedure is since he would have to be put under. Of course there are risks with either choice. So I thought, along with doing some googling, I’d ask what your experience has been with tubes in the ears. Anyone have an experience they can share? I appreciate any insight! Five or six years ago, about this time of year, Joe & I had lunch at our favorite spot on the Canaveral National Seashore and then headed over to New Smyrna Beach (NSB). Walking the coast had quickly become one of our favorite weekend activities and my newest obsession at the time was finding a full sand dollar on the beach. We always see pieces of sand dollars washing up on the shore but I had never actually found a full sand dollar. This particular day we had been walking for a few hours and I kept finding piece after piece of sand dollars but nothing more. As we headed back towards our car, Joe called for me to walk closer to where he was, away from the waterline where the waves were crashing. I made my way towards him, my feet kicking up the sand as I walked. He reached out for my hand and as I held it he pulled me towards the piles of seaweed that had washed up during the last high tide. After a few steps, I noticed a light gray shape sticking out amongst the dark green weeds. I reached down and picked it up, cradling the gentle shape in my hands. It was perfect – round with five dark ovals around the center and a small barnacle attached at the top. I found it! My first perfect sand dollar. Thanks to my husband. I’ve been searching for another ever since. With the exception of a baby sand dollar we found while on a cruise a few years ago (and left alone), I have yet to find another full sand dollar. Each time we travel to the beach, I search the waves for a sand dollar floating about. We spent today at NSB. It’s my nadir period, so we decided to head to the beach and soak in the sand, the sea and the sun. My happy place – the beach is good for the soul. As my husband hooked up his fishing pole, I told Jacob about his parents’ walk on the beach years ago. I shared my excitement about finding this sand dollar and explained that I’ve been looking for another ever since. Jacob and I decided to spend the day looking for our own perfect sand dollars. Within just a few minutes of starting our search, a sand dollar floated in on the waves, caught in the small pond that formed. I reached down and picked it up from where it was floating in the water. I handed it to Jacob excitedly. He held it in his little hands and yelled “Dada!” excited to share our find with him. We found a sand dollar! We set the sand dollar near our chairs and then Jacob & I continued playing in the surf. We walked where the water met the sand, picking up shell after shell to explore. We even found a jelly fish float up, wiggling its tentacles about as it tried to make its way back to the ocean. As we walked back to where Dad was fishing, Jacob’s little hand in mine, the waves crashed again and a round, gray form caught my eye. As it floated freely in the surf, I reached down and picked it out of the cool ocean water. Another perfect sand dollar. My excitement spilled over to Jacob and we both excitedly ran up to Dad to show him our find. He smiled brightly. What are the chances?! I’ve decided our little man is good luck. Today has proven that. *No sand dollars were harmed in the making of this post. All sand dollars were dead when found, also known as “tests”.